Local designer and crafter extraordinaire Rebecca Yaker will be on hand tonight to give helpful hints on how to save those old clothes of yours from the recycle bin at Savers. Join us out in the FlatPak house from 6-9pm tonight to re-fashion some of your old clothes that have been sitting around unworn possibly collecting mothballs. I asked Rebecca some questions about her business and her reputation as The Sock Monkey Lady. How did you become known as the Sock Monkey Lady and what attracted you to sock monkeys in the first place? I originally encountered many instances of people creating narratives to accompany their sock monkey dolls. My intrigue led me to participate in an attempt to elevate the absurdity. In response, I created my first sock monkey doll – a conjoined sock monkey complete with an elaborate persona. A couple of years later I created my first sock monkey dress, hand-woven from wool, complete with a monkey face on each breast – sort of a tribute to my original 2 headed sock monkey doll. Not until 2006 did I revisit the sock monkey. That year I participated in the WACTAC Un-Prom for which I created my now infamous Sock Monkey Prom Dress. Later the same year I entered both monkey dresses into the Minnesota State Fair, and a bizarre nationwide popularity ensued (the Internet is an amazing marketing tool, to say the least). It was then that I was coined the Sock Monkey Lady. My “attraction” to sock monkeys is relative and I am not a collector. Honestly, I don’t really care for traditional sock money dolls – I prefer a more absurd approach. In opposition to being the Sock Monkey Lady, and to help dispel the myth that I am a great sock monkey lover, I created Sock Monkeys in a Meat Grinder. Which was coincidentally awarded 2nd Place at last year’s Minnesota State Fair Fine Arts Exhibition. Tell us about your business Hazel and Melvin? What’s the process for making items like children’s bedding by hand, and why do you think it’s so popular? 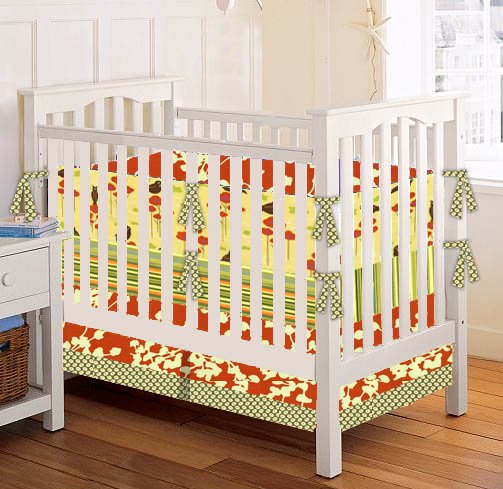 I started Hazel and Melvin’s Room in 2005 in response to an overwhelming need for non-traditional baby bedding – something other than baby pink, baby blue, or lemon yellow. Since then, my business has grown incredibly and although I continue to design and hand-make a number of ready-to-order products such as diaper bags, quilts, and apparel, my business is now primarily driven by custom orders. The “handmade” trend has exploded in recent years – people want a connection to the items they purchase – to help create a history and give meaning. Similarly, I have found that parents want to play a leading role in designing their new baby’s space and environment. All my products are customizable, from bumpers to crib skirts to specialized window treatments to accent pillows, and much more. When I work with clients, we develop a personalized color palette and print story. From there I create a virtual mock-up of the individual bedding pieces in their collection. The process from start to finish takes about 4-6 weeks. Working with so many people with different perspectives and aesthetics keeps the process very rewarding and exciting. Where did the term Upcycling come from? Upcycling was coined by William McDonaugh and Michael Braugart in their book on ecologically intelligent design, Cradle to Cradle. In the simplest terms, upcycling is the practice of taking something that is disposable and transforming it into something of greater use and value. When we recycle, we leave cans, glass, plastic, and paper by the curb for someone else to pick up to get recycled somewhere by someone. With upcycling, you are in control. You have the power to take something unwanted, unused, and/or discarded to transform it and give it new life. I understand you’re co-authoring a book? What is it about and who are you working on it with? YES! Patricia Hoskins (who owns Crafty Planet in NE Minneapolis) and I are co-authoring One-Yard Wonders – a fantastic new sewing book with Storey Publishing. In the book you will find a delightful array of 101 simple and stylish projects all requiring only one yard of fabric. Everything from apparel to accessories to toys, pet beds, baby items, bags, and home décor to name a few. The book is very thorough, complete with full-color photos, illustrations and easy to follow step-by-step instructions. We are so excited for its release this October – just in time for people to start crafting holiday gifts!! What can people expect from Thursdays Art Lab? First and foremost, look forward to having fun! This is a great hands-on opportunity to transform a tired piece of clothing from your wardrobe into one with new life and style – afterall, you are going to walk away from this Art Lab with a “new” garment! Hopefully after tomorrow night you will look at some things from a new perspective and find other items in your home and closet to upcycle. On top of all that, everyone should look forward to spending a gorgeous Minnesota summer night in the Walker Sculpture Garden – what could be better? See you there!